Yet another zombie dies... again. As with all of Capcom's PSX to Dreamcast ports thus far, Resident Evil 3 has the unlockable PlayStation extras selectable straight from the outset. This includes, quite possibly, the best battle mode found in a Resident Evil game to date. The battle mode, known as Mercenaries, puts the extra modes found in other Resident Evils to shame. Mercenaries has great replay value, rather than being a mildly distracting extra (Resident Evil 2) or a rather pointless mode seemingly tacked on at the end of development (Code Veronica). Every time Mercenaries is played your skill is converted into dollars which can be used to buy one of three special options for the single player mission. Multiple kills with one shot, the saving of civilians, efficient item usage and actually completing the mode, all come into play when working out how much cash you have earned. The cheapest special option to buy is an infinite ammo machine gun, whilst the next is infinite ammo and weapons and the last is the classic Resident Evil rocket launcher. This mode is an excellent addition as finishing it fully is a proper challenge which is enjoyable, tense (thanks to a proper time limit), and highly rewarding (multiple zombie decapitations!). The voice acting is a major weak point of the PSX Resident Evil's and this port proves to be no exception. 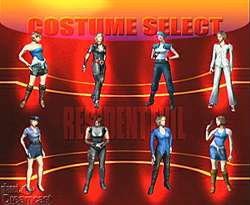 Code Veronica had excellent voice overs for the characters which portrayed real emotion and, helped by the excellent polygonal character models, delivered the plot perfectly. Resident Evil 3 is certainly second best in the series, but, like Resident Evil 2, the PlayStation models just aren't any good at filling the dialogue with human, emotional movement. Think Barbie but gorier and with more realistic proportions. 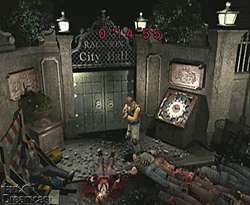 As with Resident Evil 2, the original Playstation backdrops have suffered in their conversion from a lo-res format to a hi-res one. Thankfully a lot more effort has been made this time in cleaning certain bits up, and for the most part the backdrops look quite crisp with the occasional blockiness rearing its ugly head. While the character models are definitely an improvement over Resident Evil 2's, this isn't enough to stop them from looking out of place on the Dreamcast. As was mentioned in the Resident Evil 2 review, the Resident Evil control is infamous for being disliked by some gamers. If you've been put off the series in the past by the control, this title is no different, but as long as you don't take the control out of context (i.e. trying to play the game like its an action shoot-em-up and taking on every enemy you find) the control isn't particularly frustrating - especially thanks to the inclusion of the Code Veronica 180 degree turn and an enemy dodge function. The only other major bad point to raise about this game is in its overall length. The game initially seems quite large, although in reality it's probably the second shortest in the series after the original. Thanks to the challenging levels this doesn't affect game playing time unless you cheat yourself by playing on an easy difficulty level. Finally, since the extras are unlocked straight from the start the longetivity between this and the PSX version is cut slightly. While the Battle Mode has plenty of items to earn to reward repeated playthroughs, the same can't be said of the main game. Although many will be disappointed another quick PlayStation port has found its way onto the Dreamcast, it's difficult to find much fault with Resident Evil 3: Nemesis. It delivers everything which made the original Resident Evil so fantastic but on a bigger and grander scale. At a budget price, it's difficult to go wrong with this unless you already own it on PSX. Highs: Great atmosphere, great weapons and enemies, action packed, very involving. Lows: Poor PSX port, not the longest game in the series. Other: 1 player, VMU Compatible (7 blocks), Jump Pack Compatible, VGA Box Compatible.